CT scan and Xray sagittal views of severly displaced posterior tibial malleolar fracture with comminution. This type of injury can cause significant problems in the future with disability if not treated with surgery to reduce the fracture and fixate. Trimalleolar fractures involve fracture of the medial and lateral malleoli along with a fracture of the posterior lip of the tibial plafond; (posterior malleolar fracture). 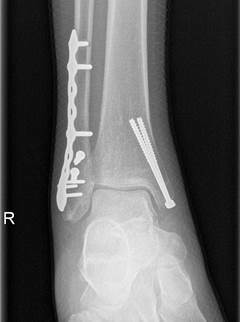 Fracture results from avulsion by the posterior tibiofibular ligament at its site of attachment to the tibia. The irregularity in the tibial articular surface of the tibia is brought against the weightbearing surface of the talus and with motion and weightbearing severe DJD develops. Valgus tilt of the talus in post-reduction film may be a relative indication. CT scan sagittal views of minimal displaced posterior tibial malleolar fracture. Both the lateral and medial malleolus with fractures with the lateral malleolar fracture classified as a Weber B (at the level of the ankle joint) and the medial malleolar fracture almost transverse (Left x-ray). This is indicative of a Supination External Rotation (SER IV) injury. 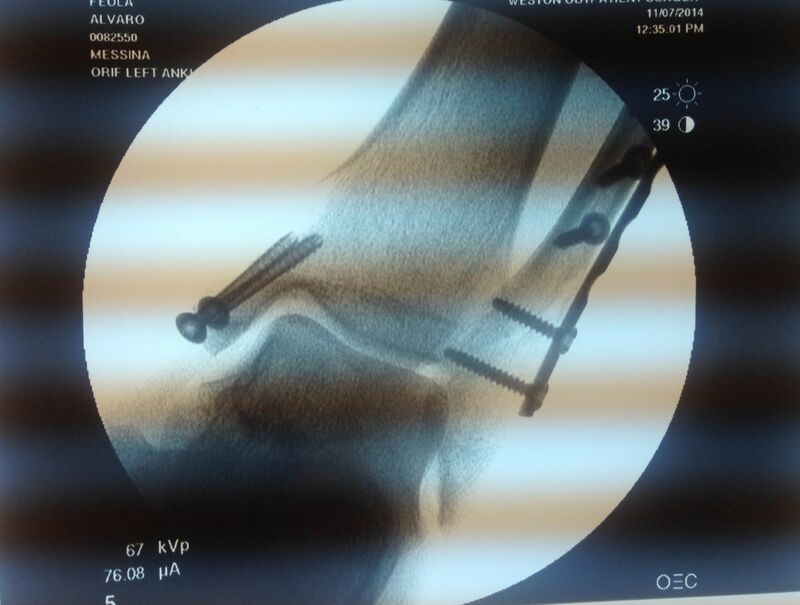 The fractures are repaired using open reduction with internal fixation (ORIF) technique and fixated with screws and a surgical fractue plate located at the fibular (Right x-ray). 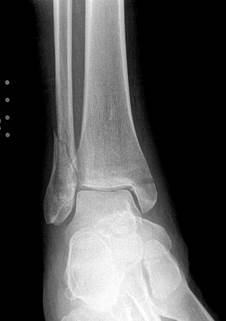 A bimalleolar fracture is a fracture of the ankle that involves the lateral malleolus and the medial malleolus. Studies have shown that bimalleolar fractures are more common in women, people over 60 years of age, and patients with existing comorbidities. Surgical treatment will often be required, usually an Open Reduction Internal Fixation (ORIF). This involves the surgical reduction or realignment of the fracture followed by the implementation of hardware to aid in the healing of the fracture. Usually a plate and screws will be used on the fibular fracture and screws, screws and pins, pins or tension band will most commonly be used on the medial malleolus fracture. 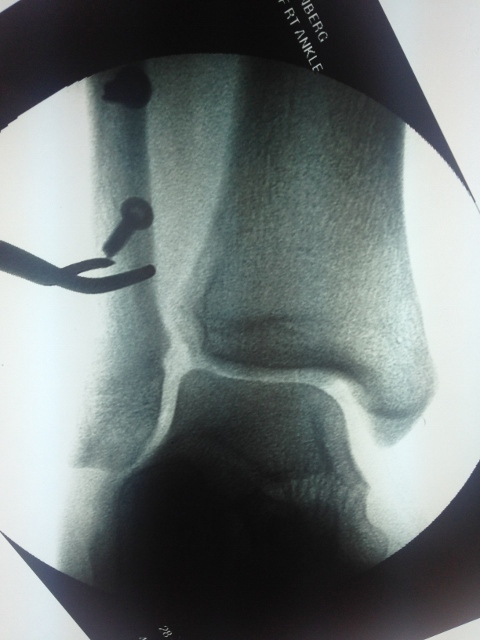 A bimalleolar "equivalent" fracture is a fracture of the fibula with rupture of the superficial and deep portion of the deltoid ligaments leaving the medial malleolus intact. 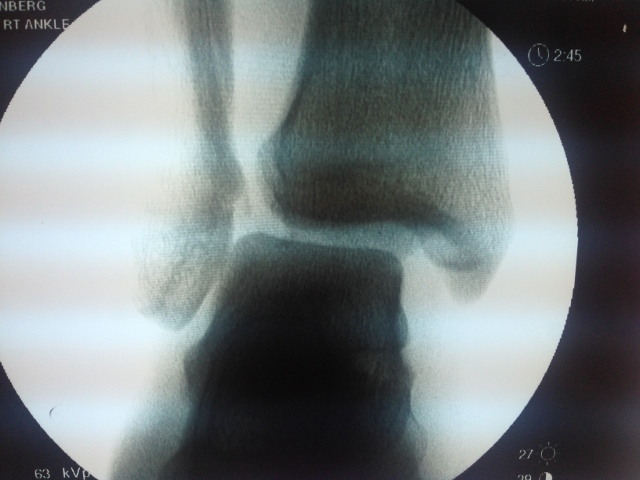 Surgical management is common due to the instability of the fracture and displacement of the talus laterally. 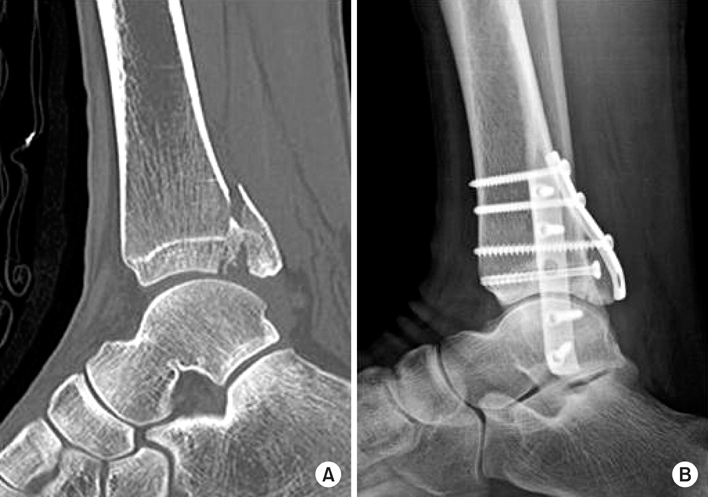 The x-ray images below demonstrate another case of a bimalleolar ankle fracture in both and oblique view (left) and anterior - posterior view (right). Below is the same patient seen above after surgical repair with open reduction and internal fixation with screws for the medial malleolar fracture and screws and plates for the lateral mallolar fracture. 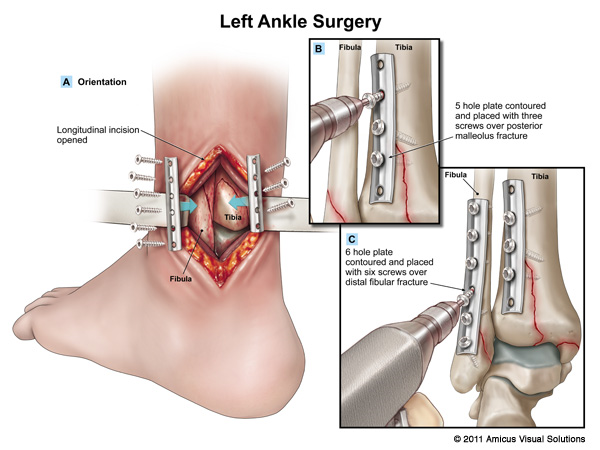 Note the even joint spacing across the ankle mortise after correction (left) that is not evenly spaced in the pre-surgical picture (above right). This is a fibular fracture that had Deltoid rupture that causes the increased space at the inside (medial) ankle. The joint should be congruous and symmertical. We know the deltoid ligament has been torn due to the medial joint space widening in the first X-ray. 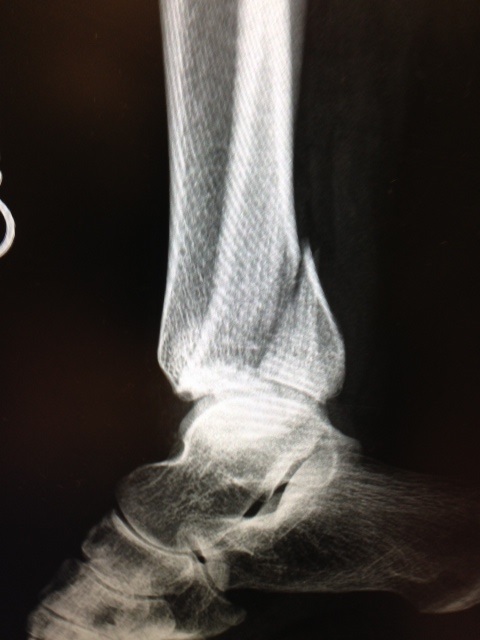 This is called a bimalleolar equivalent fracture. 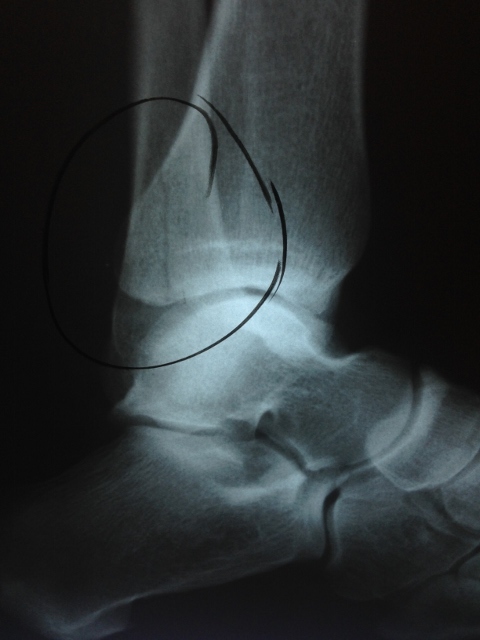 After repair of the fibula, an instrument is placed around the fibula and there is traction applied laterally to check the integrity of the syndesmosis. If there is widening of the syndesmosis with lateral pull of the fibula, the test is positive for syndesmotic rupture and will necessitate stabilization of the syndesmosis. This is a series of pics of a neglected ankle fracture after 4.5 months. 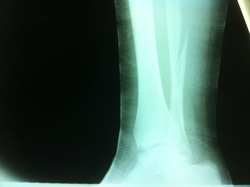 The fracture is displaced and the ankle joint is subluxed. These are pics of the fracture healed but in very bad position. The space between the talus and tibia is abnormal (spacing seen at the right hand aspect of the left hand picture). The fibula is healed but displaced laterally which allows the talus and rest of the foot to follow, translating laterally. The foot is also posteriorly displaced as can be seen on the bottom right pic. These are CT scan pics of the healed fractures with fracture callus. The abnormal joint position can be easily sen on the bottom right. The bones should be perfectly aligned. These are pics of the fibular fracture being taken down so the ankle can be reduced and external fixation applied. 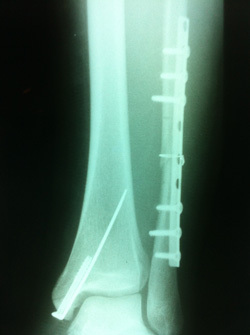 This is pics of the external fixator on after reduction of the fracture. The joint is reduced an in excellent position.